A lot of noshing, a little knitting, and not too much swearing. Yesterday was a wonderful, fibery sort of day. First I cast on a new sock. 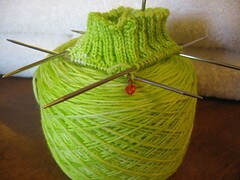 This is Lobster Pot Yarns, Sea Lettuce and it will become a pair of Zombie Socks. The yarn glows, it is so much fun. The afternoon was spent spinning. 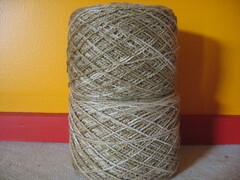 200 yards of a merino/camel blend from Dragon Fibers. 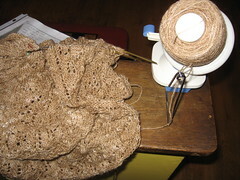 Originally Oldest Son had asked me to make a scarf with the fiber. The braid he saw was full of dark, bold jewel tones. 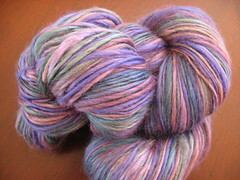 After spinning the colors are much softer and I do not think they will work for him. After a week of growling at the shawl as I walked passed, I decided to rip it out. I was a good decision. Oh I bet that ripping felt good. And that green .... stunning and delicious. I LOVE that green for Zombies! Perfect! Erin Coopey: The Kitchen Pantry Cookbook: Make Your Own Condiments and Essentials - Tastier, Healthier, Fresh Mayonnaise, Ketchup, Mustard, Peanut Butter, Salad Dressing, Chicken Stock, Chips and Dips, and More! Lindsay Landis: Breakfast for Dinner: Recipes for Frittata Florentine, Huevos Rancheros, Sunny-Side-Up Burgers, and More! Knit & Nosh blog by Terri Peña is licensed under a Creative Commons Attribution-NonCommercial-ShareAlike 3.0 Unported License. Do not use content or photos without written permission from Terri Peña.